Kegging your home brewed beer is a great time saver. Once I started to keg my beer, I never went back. However, kegging presents a dilemma for the home brewer who wants to compete, as most competitions require bottled beer. Also you sometimes want to share a bottle of homebrew with your friends. A beer gun or counter-pressure bottle filler provides the best of both worlds – allowing the brewer to bottle beer directly from the keg without losing carbonation. Virtually all commercial breweries use counter-pressure bottling systems to fill their production beer bottles. Counter pressure bottle fillers come in many shapes and sizes. One common design is the T shaped filler shown to the right. Another popular alternative is the Beer Gun, a counter pressure filler with a simplified trigger system to provide one-handed operation. If the steps are done properly, the beer will be under constant pressure during the entire process and will retain its carbonation. Recently the Blichmann Beer Gun has become a very popular bottle filler. 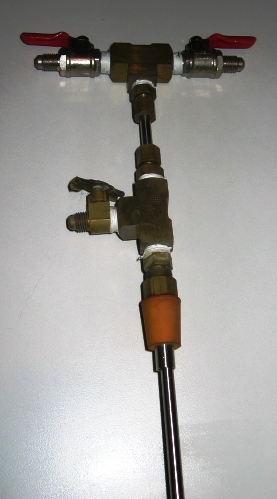 The advantage of the beer gun is that it replaces a complex system of separate valves on the older T-fillers (pictured above) with a simple trigger system making single handed operation possible. This lets you hold the bottle with one hand and fill with the other. Using the older models usually requires two people – one to hold the bottle while a second person operates the valves on the filler. Here’s a video of the gun in action. Keep the keg at serving pressure, and if possible use a filling line that is approximately the same as your normal serving line. This will assure that the bottle is carbonated at the correct pressure. Chill the bottles in the refrigerator before using so there is no change in temperature when the beer contacts the bottle. The bottles must be sterilized, which presents a challenge since they also should be cold. One trick I’ve used is to fill them with an iodophor solution before putting in the fridge, then dump before filling. Make sure that the bottle filler is properly seated before filling. I’ve had more than one popout and make a big mess. Fill the bottles nearly to the brim, as removing the filler will leave you with the correct amont of headspace. Moderate spillover when removing the filler is normal due to the pressure release before capping. Cap as quickly as possible after removing the filler to minimize the chance of air getting into the bottle. If you have your own tips on counter pressure bottle filling, please drop a comment below. I also recommend reading our summary on kegging your homebrew beer. Thanks again for joining us on the BeerSmith Home Brewing Blog. Please click on the BrewPoll vote button below or give us a thumbs up on Stumbleupon if you enjoyed today’s article. I have read your tips and appreciate you taking the effort and time to post them here for others to use. I have the unit pictured above and plan to bottle 12 grolsch bottles soon. I plan on practicing on several before proceeding just to get the hang of it without losing any beer (I hope!). Who made your bottle filler and what are the components? What was the total investement of the parts? Actually the beer gun is not a counter pressure filler. It’s more closely related to the filling tube in the cobra tap with two major innovations. First the beer flows over a little rubber bullet shaped stopper tip. This tip minimizes the co2 release, but they are easily lost and cost $5 to replace. Second, there is co2 trigger that lets you simulate the counter pressure fill by purging the bottle of O2 helping to reduce the oxidation.